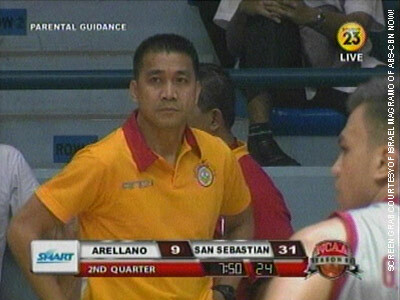 You're a rookie coach but your San Sebastian Stags are the current kings of NCAA Seniors basketball with an 11-0 card! A sweep of the second round will mean a trip straight to the Finals. Pressured? Do you guys even relax? I just tell the boys to enjoy basketball. But at the same time, we can't underestimate any team. We need to remain focused. We're just trying to shoot for as many wins as we can. Are you out to silence the critics, who've doubted your coaching acumen at the start of the season? Hindi ako nagpapa-pressure sa kanila. Basta kami, Final Four muna. Kung nagkataon ng mag-Finals agad, then we'll target the championship. Does being one of the PBA's 25 All-time Greats help in motivating your guys? If you look at my game before, my attitude was not only to play good offense, but play good defense, as well. That's what I've been telling my players. Kung ang player ko umii-score, pero umii-score din ang kalaban, balewala rin. Opponents must be stopped with good defense. I implemented a new system in San Sebastian. And from the start, what I wanted was for the team to have a good attitude and a commitment to winning.